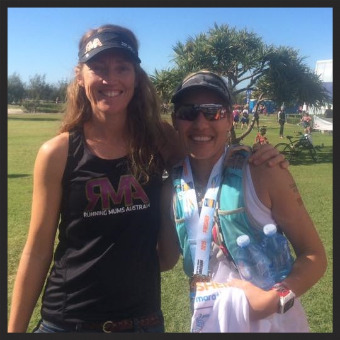 Gold Coast Marathon weekend - wrap up! This was my biggest event so far as a coach. The first time I have felt we had a "team" as such, we have shared the anticipation, come together to race, and then celebrated the highs and lows, the future dreams and goals afterward. With Debbie, Rachel, Kylie, Noelle and Nicole in the marathon and Belinda, Megan, Kristen, Sarah, Lou and Kylee in the half marathon... and myself in the 10k...cheering at the RMA tent, old and new friends, meeting some of my gorgeous runners for lunch and dinner with RMA crew...it was...eventful!!! It was PB's all round in the half marathon, great going girls (!) and three new marathons, two tough marathons - with lessons learnt and a couple of tears shed (including my own). We learn. We face our deepest selves. We keep on digging and find the lessons. Like life. And we remember those that can no longer be here to run. We do it for the love. And we step out again to learn more, dig more, find more out about ourselves... and then it's onward to the next challenge! Personally, I was not particularly focused on myself this year but I actually had a great race, despite being back training for only a few weeks I managed to race well without pressure, and whilst I didn't PB, I ran sub 40min and not only that, I enjoyed every moment racing and loved representing Running Mums Australia with my tattoo feeling tough and strong. A few days later and I'm feeling proud, reflecting on my coaching style and what I feel I have done well, where I could improve, if there was anything more I could have done. I am naturally not an outgoing person, so I think I handled myself well over the weekend. I had words that came naturally which for me is a big achievement. I probably could have been a bit more organised but I had talked to almost everyone in the week preceding the races. What did surprise me was the super high expectations some runners place on themselves which lead to disappointment (even when there was a PB!!) this was the case for several girls. Something I will be thinking about and ready for in the future. It wasn't easy with so many dreams and hopes on the line all in one day. I can set people up to do their best but I also have to let go of the outcome as much as anyone.